In a time when substance abuse is killing tens of thousands of Americans each year and quality training for addiction treatment providers can be difficult to find, The Spectrum of Addiction: Evidence-Based Assessment, Prevention, and Treatment Across Lifespan is an important contribution to academic literature. The Spectrum of Addiction is a textbook, best used at the graduate level for those seeking counseling, social work, or psychology/psychotherapy degrees and who intend to work with addicts or their families. The book might also be useful for those earning lower-level addiction counseling certificates, though the assessment tools are designed for those who are working toward or have the licenses to use those tools in a clinical setting. When used in a teaching setting, the book will inform both those who intend to work in addiction treatment centers or private practice. The book is comprehensive in scope. It begins with a short history of addiction treatment and progresses through overviews of neurology, assessment, brief interventions, family work, and social systems. It incorporates the DSM-V and the changes to substance use disorder described therein. The diagrams are clear in their meaning and the skill-learning sections are valuable teaching tools to give real-world examples of how one might interact with an addict or their family members. Most laudable in The Spectrum of Addiction is the section on brief therapeutic interventions. The majority of counselors or psychotherapists who work in an addiction treatment center receive little or no training in brief therapy while earning their degrees. This is a tragic oversight as the only therapy/counseling being provided in addiction treatment centers is brief. The nature of the treatment center—30, 60, or 90 days of treatment—is short term. Counselors and therapists in these settings need to know how to best make use of their time with patients. This means learning how to conduct brief therapy. Another excellent section is the chapter on family interventions. Not only do families need a great deal of help creating an appropriate intervention strategy for the addict or “identified patient,” but they also need help and support attending to their own needs and dysfunctions. If the family system does not change while the addict is in treatment, the addict is almost guaranteed to relapse as the force of the family system pushes the addict back into his/her assigned role. Looking at the entire system and providing support and help to multiple parts of that system is critical for creating the opportunity for the addict to find recovery and lasting change. There are criticisms of the book that can be made, not so much as shortfalls in the book itself, but the deficits the book points out in our current methods of treating addiction. First, the section on evidence-based treatment is heartbreaking to anyone who has experience in addiction treatment. The information presented is correct; but when we have to start having a conversation about “stakeholders” in addiction treatment, we are losing, or perhaps have lost, our connection to the soul of counseling. Evidence-based treatment has become a buzz-word around which all kinds of less-than-excellent treatments are given to addicts. In practice, holistic health practices which include, but are not limited to, therapies that are not easily studied in a Western research setting, sometimes provide the best results. The social push toward managed care and the understanding of medicine as a mechanistic practice rather than an art is encompassed in this book. Second, although the book implies otherwise, effective addiction treatment does not come in an easily sequenced manner. We can’t use therapy a, b, c in a specific order and duration and expect the same outcomes across clients. Addiction arises in individuals who live in complex systems and have myriad experiences and co-occurring issues that have to be addressed simultaneously. While this book is excellent in providing ideas and resources for clinicians, it does so in a way that does not adequately address the nuanced differences between individuals seeking treatment for addiction. 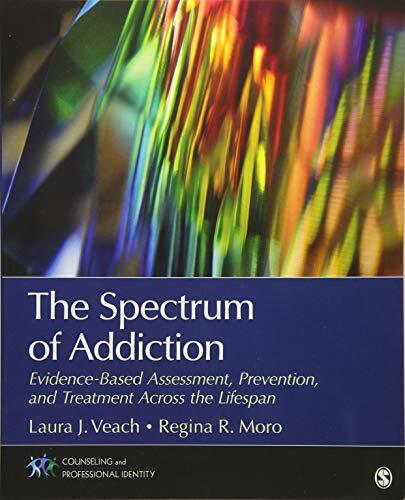 Veach and Moro’s book, The Spectrum of Addiction: Evidence-Based Assessment, Prevention, and Treatment Across Lifespan is an excellent textbook and an important contribution to training this generation of addiction treatment providers. It will best be used when paired with resources that address holistic health concepts and systems approaches to addiction treatment, to put its very useful tools in a wider and more clinically realistic context. Constance Scharff, PhD, sits on the advisory board for Rock to Recovery, an evidence-based music program providing services to addiction treatment centers. She is an internationally recognized author and speaker with expertise in mental healthcare, addiction recovery, and personal transformation.